As a place of healing and relaxation, Orr Hot Springs is committed to welcoming all guests to our property, including those with disabilities and/or mobility issues. If you are planning on visiting us, please keep in mind that Orr Hot Springs is in a rural location and surrounded by a forested environment. If you have any general questions about the property or any issues you believe may affect your stay, please call us at (707) 462-6277. For more information about ADA accessibility, please contact Ben at (707) 463-2516, or by email at orrmanagement@gmail.com. All paths and walkways are covered in pea gravel, except in the Bathhouse. Orr Hot Springs does not provide telephones, or other means of communication (Internet access, etc.) in any guest rooms, and there is no cell service once you reach the property. A member of staff is always on the property, and a walkie-talkie can be provided with which to communicate with them in the event of an emergency. Guest rooms do not contain private showers (except for the Creekhouse), and many do not contain private bathrooms (please see the Accommodations page for more information). All guest rooms are equipped with standard electrical outlets, so that guests may use or charge electronic devices. Orr Hot Springs provides a designated parking area for people with disabilities (see map below). The restrooms in the Changing and Locker room are fully ADA compliant, and are equipped with grab bars. 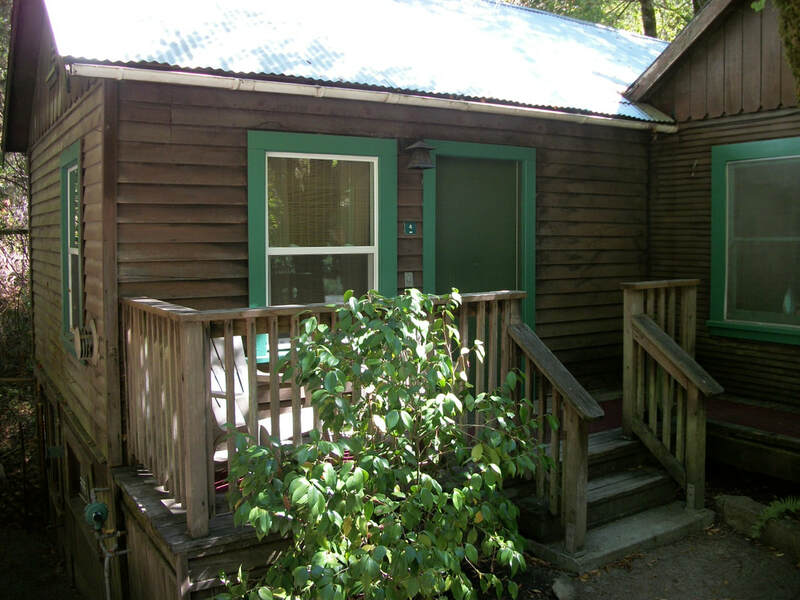 Orr Hot Springs currently designates Room 4 as an ADA accessible room. 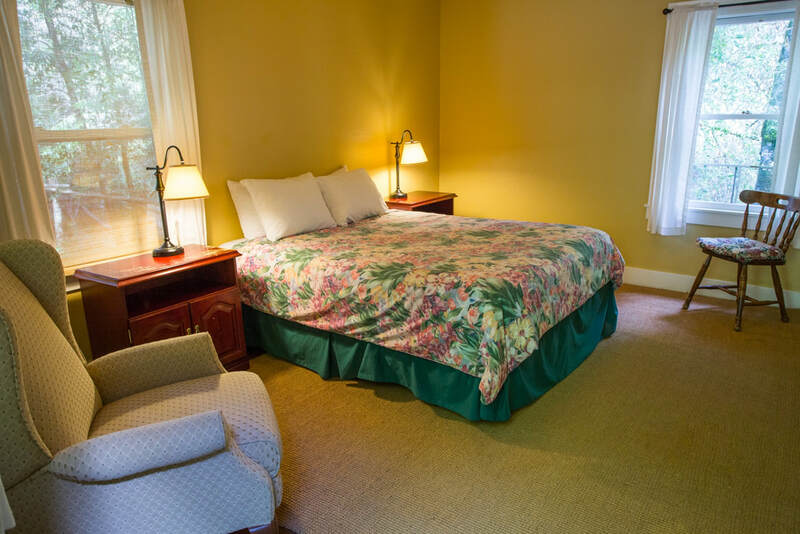 We currently do not take online reservations, however Room 4 can be booked by persons with disabilities by calling our Reservations Department at (707) 462-6277. Room 4 cannot be booked by persons without disabilities, until it is the last room remaining to be rented. A ramp leading leading from the main pathway and Lodge building. A viewing port on the door at wheelchair level. An ADA compliant smoke detector with both audio and visual indicators. Like many other rooms, Room 4 does not include a private restroom, and the closest ADA accessible restroom is in the Changing and Locker room. To see pictures of the various soaking options, please use the menus at the top of this page to navigate to "The Property" -> "The Bathhouse"
Grab bars mounted on the front and left walls. 2x 12" steps down into hot water. Has a metal rail leading down the steps. A pneumatic chair lift can be installed upon request. There is a staircase with 8 standard steps down to access the Private Tub area. The lip of each Private Tub is approximately 23-24" from the ground, and there is a grab bar at the foot of the tub. The lip of each Stargazing Tub is approximately 22" from the ground, and does not have a grab bar. Staircase with 7 standard steps down into the cold water. Has a metal rail leading down the stairs. Wheelchair Accessible, however due to the high humidity and temperature this room reaches, wheelchairs are not recommended. First level of seating is 19" from the ground. Wheelchair Accessible, however due to the high temperature this room reaches, wheelchairs are not recommended. First level of seating is 22" from the ground. 1 large step 22" down into the hot water. No grab bar or railing. Orr Hot Springs allows Service Animals per ADA regulations. Service animals must be in the presence, and under the control, of the person to whom the Service Animal provides service at all times while on the property. Service Animals cannot be left in cars in the Parking Lots unattended. Service Animals must be well behaved, non-aggressive, and must not unreasonably disrupt standard operations of the business. Please keep in mind that Orr Hot Springs currently has domesticated cats that roam the property. For questions or more information about our Service Animal policy, please call us at (707) 462-6277. For more information about ADA accessibility, please contact Ben at (707) 463-2516, or by email at orrmanagement@gmail.com.